To Be a Roman is an indispensable resource for today's classroom. This workbook is filled with the latest information about the daily life of the ancient Romans and with ample exercises of both an objective and creative nature. In Latin classes where gaining knowledge about Roman culture is a necessity for students trying to learn the language and in classes where the daily life of the Romans is the primary subject matter of the course, this book fits the bill. 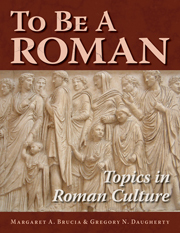 To Be a Roman presents seventeen topics along with two review chapters and one chapter that contains a plethora of resources, both those of a general nature and those specific to each chapter. The topics of the first seventeen chapters include the Roman family, house, occupations, domestic life, education, and more. These chapters are arranged in a logical order but may be used in any order. Photographs of artifacts and sites are included in each chapter. To Be a Roman Grades 6-12. $25. Bolchazy-Carducci Publishers, Inc., II. (800) 392-6453. www.bolchazy.com. Is your student studying Latin or the time of the Romans? The To Be a Roman workbook introduces students to what basic everyday life was like during the time of ancient Rome. The fairly short chapters-17 of them-present the basics of Roman society: its social classes, religious life, housing, domestic life, education, slavery, urban life, laws, farming, occupations, travel, trade, measuring of time and space, leisure and entertainment, and the stages in the lives of boys and men, and girls and women. Each chapter in this 168-page workbook includes basic information along with several black and white illustrations or photos of various artifacts. At the end of each chapter are questions to answer, and sometimes a word search or crossword puzzle. Be warned, there is no answer key. However, you'll find two review chapters plus a bonus chapter of additional resources, including books, films, websites, historical novels, and more. To Be a Roman is not a comprehensive study of ancient Roman culture, but it does offer insight on everyday life where other materials don't. Be prepared to talk about some of the areas of Roman life that were harsh, such as leaving babies exposed outdoors to die because of a birth defect or the fact that the baby was an unwanted girl.